I have never traveled abroad before and I am planning a trip to the Philippines in January. I will be arriving in Cebu and taking a ferry to Bohol. Upon my research on the internet, that seems like the typical tourist trip taken. Of course, my research and my inquiries have turned up even more questions about traveling abroad that I can find answers for. For one, how safe is it to travel to the Philippines? I have discovered that kidnapping does indeed happen there and that theft and robberies are commonplace. Of course, being a smart traveler will help safeguard against dangers, but there is no guarantees in life either. In order to be a smart traveler, I felt I needed to write this blog to hopefully get some tips on traveling abroad from the more experienced than myself. Here are some additional concerns that I do have, that I have heard from some other people...not sure how true they are or not. Any other things I should watch for would greatly be appreciated. ...My first hold over will be in South Korea. (I was told that I would have difficulty making it out of that airport because they are huge and very busy and that the signs will be written in a language other than English). That really does not make sense because it is an international airport. But, I have never been there so I don't know for sure. ...This leads to another concern. I will be traveling by myself...and of course being new to this experience, I myself am also responsible for any language barriers. Not everyone I am going to need to associate with will know English. How do you communicate or deal with situations like that? ...I was also told that security at airports look for people who are nervous and will take them for questioning. Sometimes that questioning can go bad really quick, especially if there are language barriers. There is a good chance I will be a little nervous at times being an unseasoned international traveler. Any advice about that? ...I was also told to be very careful in international airports, especially the Philippines about employees slipping things in your luggage and then asking for money from you to not report it. I was told to not have luggage with pockets on its outside and if you can, wrap your luggage. Also, don't help anyone carry their luggage because this is how drugs get transported and if you get caught carrying that luggage, of course you will be responsible for its contents. ...Also, are there any tips on getting great airfare rates? ...Anything else that a new international traveler should be careful with or it would be helpful if it is known about? I agree with those who recommend traveling light. I take a travel backpack that is the largest size most airlines will allow. I would check with the airline as to their size limits as it can vary a little. I also have a small bag for my lap top and a few personal items. If you can get by with just a carry-on it gets you ahead in the customs line of people waiting to retrieve checked luggage. This is the one I use and like. Don't leave your drink unattended at bars. That pretty girl that has been flirting with you might slip you a Mickey. Just try and blend in. At least Learn to speak some of their language! If not more. Even if its just one word! And say it out loud all day and night! Every 30 minutes. Sorry! Johnny. We are good friends. But I Had To Have a Little Fun With You . PS. Please! Do Not Call Robert! Notta Good Ideal. Johnny, be sure to call Angel, to find out what's on TV when you're over there. They might even have the Maury ("You are the father!) show. I think you've got all you need to do for a safe travel to Philippines, with all the tips bloggers shared. Travelling now a days is easy and safe. From international airport, you don't need to hire a taxi , no more. There is that shuttle bus going to domestic airport. So no need to go out at the international airport . Filipinos are acommodating though some with benefits, well that happen everywhere in the world. But no worries, Filipino's could speak and understand English very well. I visited West Africa as I thought it was a real adventure. It was indeed, I had to be with me that translator apps in my Cp. Asking something like watched over my luggage, needs money. Just be friendly in your approach and no one will treat you badly. Travel light, just a hand carry luggage..I got problem with my checked in luggage which, I got it after two weeks of arrival in West Africa. Good thing I had clothes in my hand carry luggage. And bought some personal things which supposed I had everything. Just be smart Johnny...that's the most important thing you need with all your things packed..my phone was snatched two times in Philippines, so avoid showing expensive things in public that would invite thieves..
Hello YN, that is the plan one day to do more traveling. Thanks for the advice. Hello Riz, I can really tell you know what you are talking about...and as Pepps has suggested right after your post, I will indeed be making copies of everything here and will be making sure to follow much of it. Thank you for taking the time with sharing your experience and knowledge here. Pepps, you are so right about studying all this information and being well informed. I did plan on traveling light, but from some of the suggestions, it sounds like I should travel extremely light. I will see what I can do. Thank you Pepps about keeping current locations broadcasted to friends and family. It is nice to see you again Pepps...hope life is all and well for you. Those mountains are incredible...it makes me wonder how they were formed. Thanks for sharing that...I would love to see those. Riz, thanks for the additional advice regarding converting money. I did know about carrying a minimum amount but didn't realize about the huge stack of pesos and also the poor exchange rate.....good info. The more I hear here, the more I do like the idea of trying to travel similar to what you are saying. It is wise to keep your luggage in sight at all time and I was informed that a back pack can also be put on the floor by your feet...allowing you constant supervision. Much appreciated, thanks. Pepps, that is a good idea with buying clothes there and blending in. Also about learning a few words too. I like that. Believe me Pepps, Robert was not even on my mind when you mentioned about calling friends for survival advice. Just teasing Robert. Robert, I could use a travel partner for over there. Maybe would could both call Pepps? Thank you so much for the great advice. I am planning on traveling as light as possible, and like you mention, I heard that cell phones are a prime target over there. BTW, I am happy to hear you got approved for your visa. Johnny, the last time I was in the Philippines, they stole my Rolodex, and they wouldn't accept my food stamps. Maybe now is a good time to be there for October Fest.. lots of beer. Robert, I am sure it is not that bad....each and every area of the world one is a stranger to needs to be informed of their environment they are about to travel into. 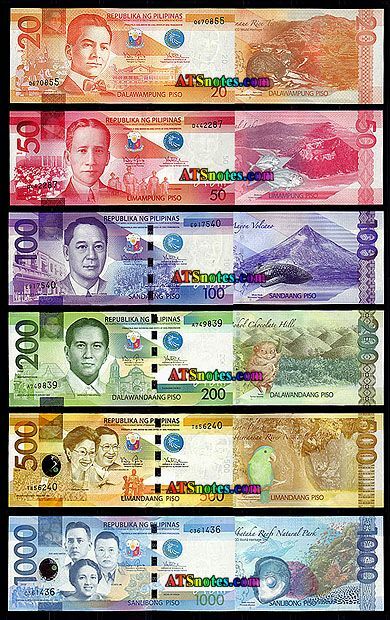 Just thought of something else .Philippine money in notes 1000, 500, 200 (not so common) 100 50 20. 1000 peso is around 18 dollars, ATMs and FX agents tend to only give 1000 and 500 notes, shops and especially taxis will always ask for exact money, taxi drivers never carry change, so a 300 peso trip could cost you 500, just because you only have 1000's or 500's, so always carry low denomination notes and loads of coins. This is NOT Philipine specfic, Just about every country in the world is the same, especially Taxis. Note the 1000 and 100 are similar to the unaware although the new notes are much better, still easy to make a mistake. I know you are just being funny. I don't want to beat down a whole country. It is sad that there exist this sort of widespread behavior in any nation....but, I sincerely feel terrible for the genuine loving people within those nations....and I would never want to stereotype a whole place. Thank you Riz...very informative. It is nice you showed the pictures too. You are right that the 1000/100 can be confused if solely going by the color of them. Do I win a set of travel luggage for the 100th comment? I did want to post yesterday but got the time only now. Haven't read all the comments hence sorry if I've duplicated someone else. Think about the advantage of travelers cheques. A small amount of cash is good but to lessen the worry of losing cash, why not use travelers cheques instead.The exchange rate of dollar to peso is surely better in Metro Manila than in the provinces. But the chance of losing your cash is great. At least with TC, when you lose it, you can just advice the bank to stop payment. One downgrade though is that the exchange rate of TC's is way lower than the cash. Happy trip and may she be The One for you. Hi Johnny, I didn't read any of the fool proof advice nor have any to give. Every airport is different. So you will discover what all the jazz is about when you reach. I am only glad to see things are progressing. Take care buddy and all the best. It's an interesting place... I would say you have to keep your wits about you in any country. Oops, I did not see the last 3 commenters....sorry and thank you so much for the advice. I am just in the process here of making copies of all the comments and I am going to go through them and highlight, what I feel, are the important elements. Again, thank you all who have taken the time to contribute your thoughts, wisdom, experience, and advice.